We aim to include a maximum number of countries in the Report every year, within the constraints posed by data availability. To be included in the Report, a country must have data available for a minimum of 12 indicators out of the 14 that make up the Index. In 2016, we have been able to include 144 countries in the Report. Of these, 107 have consistently been included in the Report every year since the first edition published in 2006. Nearly 200 countries were considered for inclusion this year. Out of the 144 ultimately covered in this Report, 18 countries had one data point missing and 31 countries had two data points missing. Missing data is clearly marked on each relevant Country Profile. This year’s Report features one new country never previously covered, Bosnia and Herzegovina, and one country previously covered once in 2012, Timor-Leste. Until last year’s edition, the Report grouped countries into six broader geographical groupings: Asia and the Pacific; Europe and Central Asia; Latin America and the Caribbean; Middle East and North Africa; North America; and Sub-Saharan Africa. As part of the careful updating of certain elements of the Report, going forward the Global Gender Gap Report will group countries into eight geographical groupings: East Asia and the Pacific; Eastern Europe and Central Asia; Latin America and the Caribbean; Middle East and North Africa; North America; South Asia; Sub-Saharan Africa; and Western Europe. The classification of countries according to these updated categories is detailed in Appendix A. Datasets of both the classical groupings and (compiled retroactively) the updated groupings are available for time-series analysis. Figure 1 provides a global snapshot of the gender gap in the four subindexes. It shows that, on average, the 144 countries covered in the Report have closed 96% of the gap in health outcomes between women and men, unchanged since last year, and more than 95% of the gap in educational attainment, an improvement of almost one full percentage point since last year and the highest value ever measured by the Index. However, the gaps between women and men on economic participation and political empowerment remain wide: only 59% of the economic participation gap has been closed—a continued reversal on several years of progress and the lowest value measured by the Index since 2008—and about 23% of the political gap, continuing a trend of slow but steady improvement. Weighted by population, in 2016, the average progress on closing the global gender gap stands at a score of 0.683—meaning an average gap of 31.7% remains to be closed worldwide across the four Index dimensions in order to achieve universal gender parity. 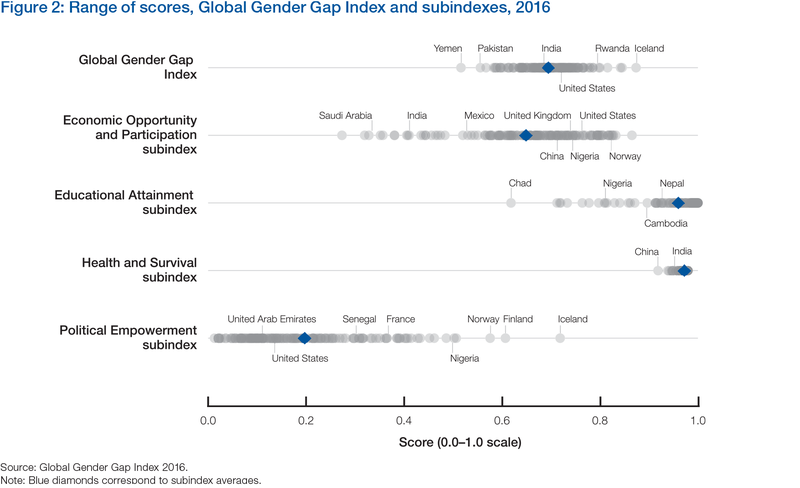 Out of the 142 countries covered by the Index both this year and last year, 68 countries have increased their overall gender gap score compared to last year, while 74 have seen it decrease. It therefore has been an ambiguous year for global gender parity, with uneven progress at best. Table 3 displays the 2016 index and subindex rankings, organized from highest to lowest by rank, on the overall index. No country in the world has fully closed its gender gap, but four out of the five Nordic countries and, for the first time this year, Rwanda, have closed more than 80% of theirs. Yemen, the lowest ranking country, has closed slightly less than 52% of its gender gap. For further analysis, refer to the Performance by Subindex, Top Ten, and Performance by Region and Country sections. Table 4 displays the rankings by subindex, organized highest to lowest by rank per subindex. On the Economic Participation and Opportunity subindex, 11 countries (three less than last year), including four from Sub-Saharan Africa—Burundi, Botswana, Rwanda and Ghana—and three Nordic countries—Norway, Iceland, and Sweden—have closed more than 80% of their gap. However, 19 countries, 15 of which are from the Middle East and North Africa region, have closed less than 50% of the gap for this subindex. Pakistan and Syria hold the last two spots on this subindex. Thirty-two countries have scores below the world average (0.586, weighted by population) on this subindex. The Report’s Country Profiles include a wide range of additional contextual data, including on workforce participation, economic leadership, access to assets and technology and the care economy. In 2016, 24 countries have fully closed the gap on the Educational Attainment subindex, one country less than last year. Guinea, Benin and Chad hold the last three spots on this subindex, with Chad having closed less than 70% of its education gender gap. In total, there are 17 countries where women still have less than 90% of the education outcomes that men have—a marked improvement over last year, when this was still the case for 22 countries. 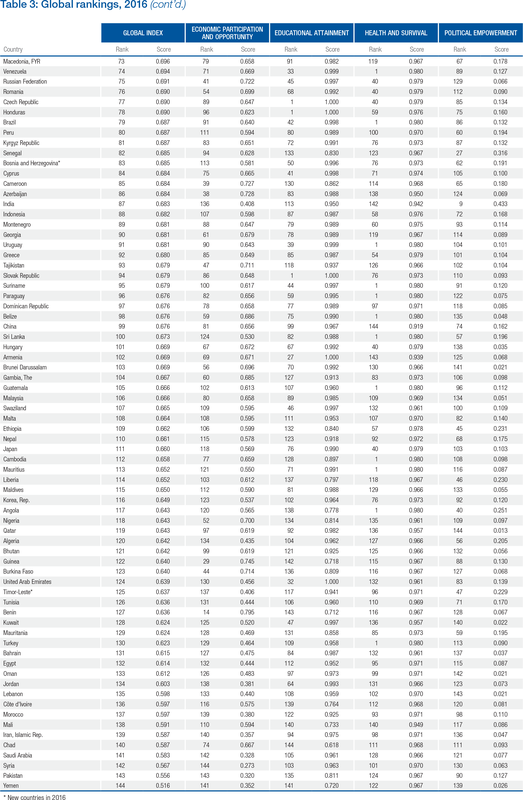 Thirty-four countries have scores below the world average (0.955, weighted by population) on this subindex. While the Index takes into account four key indicators to measure the gender gap on education outcomes, the Report’s Country Profiles provide information on additional gaps between women and men—on out-of-school children of primary and secondary school age, education attainment rates, advanced degrees, STEM education and skill diversity. Thirty-eight countries (two less than last year) have fully closed their gender gap on the Health and Survival subindex. 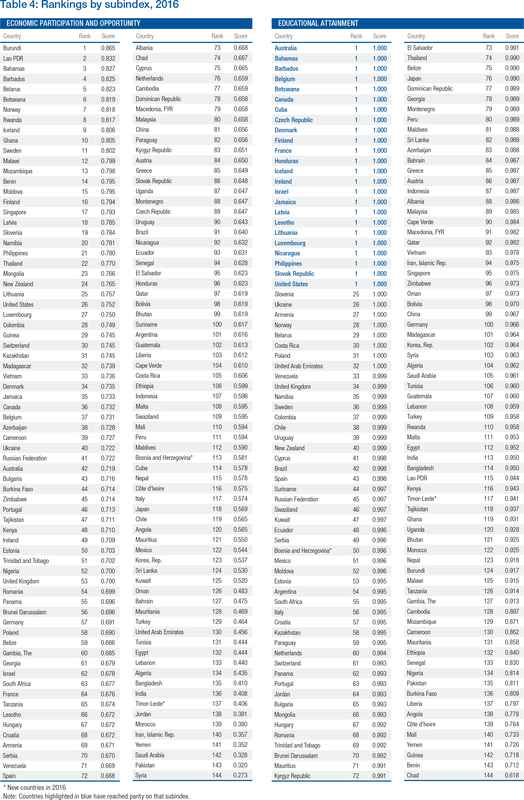 India, Armenia and China are the lowest-ranked countries, and no country currently has a gap bigger than 90% on this subindex. Only seven countries have scores below the world average (0.957, weighted by population) on this subindex. While the Index takes into account two key measures of gender gaps, this year’s Country Profiles present additional contextual data that reveals differences between female and male health outcomes from cardiovascular disease, cancer, diabetes, respiratory disease, HIV/AIDS, suicide and malnutrition. Additionally, the Country Profiles contain detailed information on maternal health and domestic violence. On the Political Empowerment subindex, only Iceland has closed more than 70% of its gender gap and only Finland has closed more than 60% of its gender gap; 39 countries, from across all world regions, have closed less than 10% of the gap (unchanged from last year). Oman, Lebanon and Qatar have the lowest rankings on this subindex, having closed less than 3% of their political gender gap. Weighted by population, 100 countries rank below the subindex world average (0.233) this year. In addition to the indicators included in the Index, the Country Profiles present detailed information on women’s political participation, such as the number of years since the establishment of women’s suffrage, female heads of government to date, and the existence of voluntary political party quotas. While nine countries—Bahamas, Barbados, Finland, France, Jamaica, Latvia, Lesotho, Nicaragua and the Philippines—have fully closed the gap on both the Health and Survival and Educational Attainment subindexes, no country has yet closed either the Economic Participation and Opportunity or Political Empowerment subindex gaps. Figure 2 illustrates the range of country scores for the four subindexes. The population-weighted average for each subindex is highlighted by blue diamonds. The Educational Attainment subindex is on the verge of overtaking the Health and Survival subindex, which has been stagnating for a number of years, to become the subindex closest to reaching universal gender parity. In fact, as of this year, it has already done so for the 107 countries that have been consistently featured since the first edition of the Report. However, Health and Survival is also the subindex with the lowest spread of scores, with most countries clustering around a fairly high achievement point near parity, while issues remain primarily in a number of large-population countries with distorted birth ratios due to “missing women” and gender-specific gaps in access to healthcare. By contrast, despite much recent progress in a large number of countries, global outcomes on the Educational Attainment subindex remain more uneven, with a wider spread of scores. The widest range in scores is found on the Political Empowerment subindex, followed by Economic Participation and Opportunity.